Unbuckle your hat and stay a while. You know summer is finally here when you start thinking about how many days are left before it’s gone. It’s not that I’m a pessimist. I just look ahead to what’s next rather than fully enjoying the moment. Sundays are the perfect example. Although Sunday is considered a weekend day, because it’s also the day before the next school/working week, it ‘s not a full day off. I’m the same way with summer. Call it a design flaw (Thanks Mom and Dad! ), call it practical, call it what you will, that’s where the story of this week’s soup begins. Since we still haven’t gotten our vegetable garden up and running—the basil’s still pretty small, the tomatoes are going nowhere, and, well, that’s about it—I’m forced to take my inspiration from the supermarket. The vegetable that caught my eye this week was the parsnip. The parsnip, the carrot’s pale, sharp-tongued cousin, is really more of a fall vegetable. They’re available during the summer too, obviously, but the fall is when most of the other produce disappears for the winter and leaves behind the lonely root vegetables: parsnips, carrots, onions, etc. So come Thanksgiving, that’s what I serve: roasted root vegetables. As you’ve no doubt come to expect, thinking about this fall dish led to inescapable question: Is there a soup here? 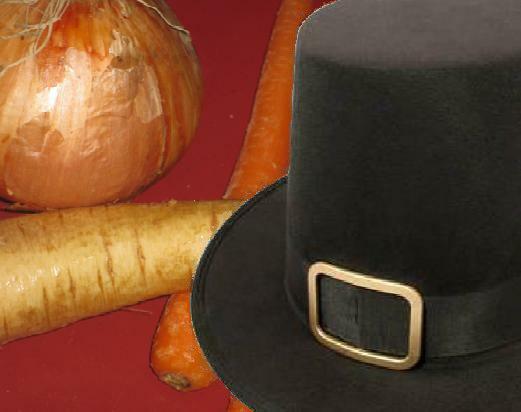 In November, I go all out with the root vegetables—carrots, parsnips, onions, beets, turnips, rutabagas, garlic—the whole cornucopia. For the soup I stuck with carrots, parsnips and onions all tossed together with a little seasoning, olive oil and dried rosemary. The key to getting the right taste is the roasting. I tossed all the ingredients together with the salt, pepper, oil and rosemary then spread the mix across several baking sheets so they would get that sweet crispy baking with flavor. This meant I had to use a lot of pans because I don’t want to steam the vegetables and make them into indistinct mush. Yes, you’re just going to put it all together in a soup at the end but you’ll lose a lot of flavor if you don’t roast the vegetables properly, which would be sad. And who wants to be sad in the middle of summer? Or fall, winter or spring for that matter? The larder is full. There’s lots of fresh food available. It’s nice out. By November, most of this will be gone. Not that I won’t be grateful then too. November’s almost navel orange season. But why wait? There’s always something to be thankful for. Even Sundays. Note: Go easy on the salt and pepper in this recipe. I went a little overboard this week and left a bad taste in the mouths of our houseguests. They were senior bloggers and webfolks Laurie Niles (violinist.com) and Robert Niles (themeparkinsider.com) and they both taught me a lot although it might not be evident just yet. Toss vegetables, rosemary and olive oil together and spread out onto as many baking sheets as necessary to keep from crowding then place pans into oven for 20-30 minutes. Scrape roasted vegetables into a pot with the stock, 6 cups for a thicker soup/8 for a thinner/7 just right, season lightly, bring to a boil, reduce to a simmer for 30-45 minutes. When I finished this soup, I pureed it with an immersion blender but that was only because some of the vegetables got a bit too much color (i.e. they burned) and I didn’t want that color mucking up the soup. If you’re roasted roots haven’t been blackened, pureeing isn’t necessary. Serve warm with grilled meat and/or a nice summer pasta. Image Credit: Photo of Root Vegetables and the buckled Pilgrim hat cliché by the author. What foods are you grateful for? Do you eat them in summer, fall, winter or spring? If you’d let me know, I’d appreciate it. I’ll be reading and responding.